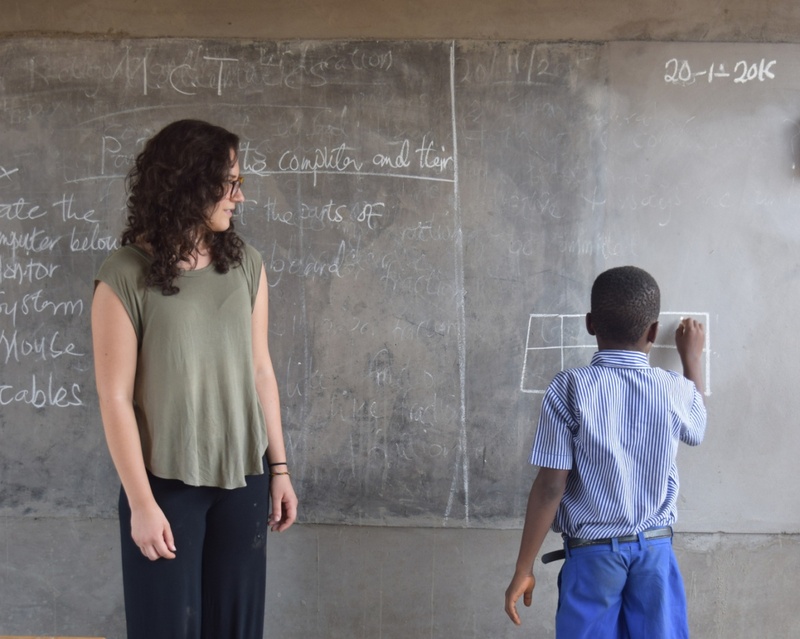 CEPS students have helped bring sustainable solar energy to a school in Ghana. In January, that vision became a reality when the Takumi Community School in Toh-Kpalime, Ghana, was outfitted with a 1.2-kilowatt solar energy system through UNH Solar Power for Schools (UNHSPS), a project that will improve the quality of education, allow for community meetings and power technologies that drive economic development in a sustainable way. Joining Messologitis on the project were Zachary Angelini ’14, Taygra Longstaff ’15, Abygail Mangar ‘14 and Tegan O'Neill ’14. Angelini is a UNH graduate student in civil engineering, and O’Neill is a UNH political science graduate student. All five students spent some time in Ghana during the winter break to assist in the planning, installation and maintenance training of the solar panel system. Students from the Takumi Community School in Ghana. The UNH students' effort began as a senior capstone project in 2014. They connected with a Canadian nonprofit organization, DevXchange International, which had a connection to the village. Messologitis and Angelini traveled to Ghana in August 2014 to meet community leaders, interview solar companies and select the firm best matched to help meet project goals. Before their return visit, the group worked remotely with Atlas Business Energy Systems and community leaders to determine the size and placement of the panels and how to secure the panels. They also developed a training and education program to ensure the panels would be properly maintained. The project’s challenges included a delay in the installation process because structural reinforcement was needed to support the rooftop solar panels. The group chose to install them on the roof for security reasons. The six-panel system powers lights and fans in the three-building school complex that serves more than 175 students from multiple villages. The low-maintenance solar system is expected to last 25 years with a 10-year battery replacement. The project cost $30,025 and was funded by a variety of sources including the UNH Parents Association, the UNH Emeriti Council SISI Grant, the College of Engineering and Physical Sciences and the UNH Social Venture Innovation Challenge, as well as donations from various individuals and engineering firms. Environmental engineering professor James Malley, who served as a technical and academic advisor on the project, says he is proud of the students’ ability to navigate the challenges and finish the project successfully. The project was a learning experience for the students in Ghana. The project also served as a learning experience for the community members and schoolchildren in Ghana. The village often faces power outages during peak usage times, and with the new system, those outages will be eliminated. The project allowed UNH students to show the difference between renewable, reliable and sustainable power versus a system that is unreliable, not sustainable and nonrenewable. Messologitis, who was on site for the final installation process, says she was inspired by the transformation she saw in community members during the training session. Though the UNH students are confident in the community’s ability to maintain the system and plan for future maintenance, they are planning a return trip next year. “We want to return so we can determine any challenges the community has encountered with the system, continue solar energy education and work with the community to develop revenue streams that can be used to expand the system,” Angelini says.